In January, Kansas City-based painter Tom Gregg held an open studio. A group of new still life paintings hung salon-style on one white wall. The wall glowed. Tom Gregg has always been an impressive colorist. The color in these recent paintings has become impossibly vibrant. 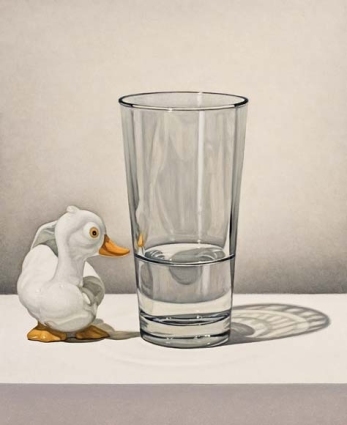 The color seems to want to tell a story, reflected light has a personality. 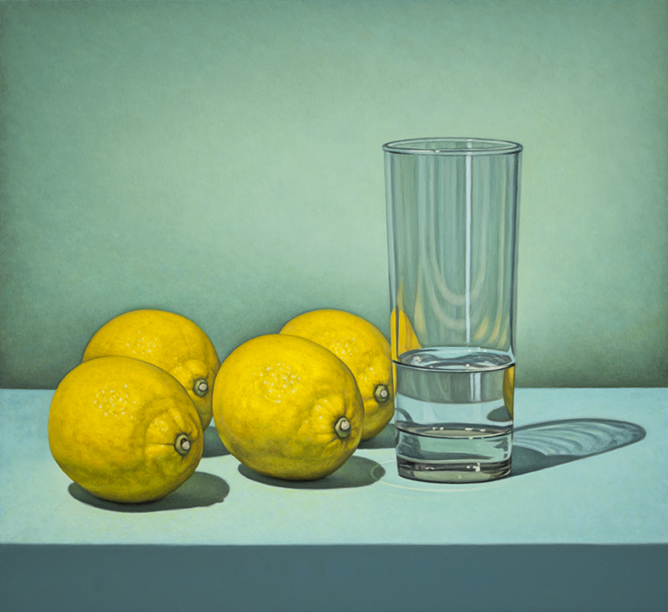 Making the inanimate and inarticulate come to life seems to be a central part of his project, starting with the color and going on to include the objects he chooses to paint, the paint he works with and the very act of perception itself. In the interview that follows Tom talks about the work that goes into arranging and observing colors, about taking color out of the paintings for a few years and more about his practice in general. Please tell our readers a little bit about your background. How did you end up becoming a painter? I lived in Southern California until I was 7, but then moved to Butler, a small steel mill town outside Pittsburgh, Pennsylvania. I was always drawing and making images and I can’t remember not wanting to be an artist, or ever really wanting to be anything else. Of course I had no idea what that was, I just knew I got a particular satisfaction from making stuff. My family was very supportive, and particularly very education focused, but I don’t think they ever hauled me to an art museum, although I did see a lot: Disneyland, the Grand Canyon, the ocean, etc. I don’t know what my art, or what I, would be like if I had been raised like my kids are being raised, always being taken to art openings, museums and galleries. As for me, I was fascinated by the paintings and illustrations in history books and any exposure to art was probably from sources like these. And then I sort of snuck into art school by applying to Rhode Island School of Design as an architect (I had good academic credentials). I lasted about 2 weeks in the actual architecture program and eventually ended up majoring in printmaking. Talk about your creative mulch–that is, your daily inspirations, fine art and not fine art. Someone recently asked me if beauty played a role in my life, and I was shocked at the question. I can’t imagine living without the idea of beauty as a part of my everyday experience. I feel like it saves me from going over some edge, or into some trance of complacency, all the time. And by beauty I count raw experience and the sensual world; things like seeing the light over the West Bottoms from the top of 12th Street, [the West Bottoms are a Kansas City neighorhood, home to large manufacturing and warehouse buildings that now house many artists’ studios–ed], smelling rain in the air in the summer, eating really great food, etc. Things like this bring me close to tears all the time. And then there is art: seeing how others have taken their experience of the world and responded to it by creating forms that speak to the rest of us. I try to devour as much of this mediated experience as possible, in all forms, from music to writing to movies to visual art to theater to dance. Art brings me close to tears all the time. There is a constant struggle for balance with raw experience and it is difficult to say which inspires me more: pure, raw life or the forms created by others. Please tell us about one useful thing you were taught or told. As an undergrad I took as many figure modeling classes as I could; I love working from a model in any way, and I love getting my hands in clay. I had a teacher, a sculptor, named John Bozarth. He would spend the class quietly walking around, then every so often stand behind you for a few minutes, and say something like “I think the shoulder blade is a bit lower on the left” or “the hip pushes forward more”. No grand ideas, no theories, no lecturing. But a cumulative opening up and sharpening of my ability to see and respond to what was right in front of me. In graduate school at Yale Andrew Forge told me that as an artist one doesn’t so much go in circles as one goes in a spiral: seeing the same points, but from a position higher up, further in time. Right out of undergraduate school I was a bit lost and working for a landscape company. The boss was John Crispino, an Italian immigrant who, when you did something well, would yell,”beeyufitul”. It was the hardest I had ever worked; you had to be at work at 7:00 am sharp and we would work until 6:00 or 7:00 pm. Tough, physical labor all day, with almost no breaks; things like breaking up boulders with jackhammers, digging up and moving trees, and pouring sidewalks. And all for minimum wage, which at the time was $3.30. I worked mostly with a guy a bit younger than me named Tony. He had been working this job for years. For some reason, pride or simple stubbornness, I felt competitive with him and was determined to be good at the job, and was killing myself in the process. And then one day, Tony, who didn’t talk much, let me know that his dream was to some day be a landscaper and to have his own company. He was doing what he wanted to do with his life, right then and there; it was simple in his way of thinking. He was a bit puzzled with me and as to why I was working there, when I wanted to be an artist. Inclement weather interrupted the job, and when they called me to come back, I said no. From that point on I accepted more fully what I really wanted to do and refocused my time and energy towards getting there. When is it important to be accurate or ‘right’ in painting? Things can feel right, or look right, but that is an elusive and intuitive sort of response, not something that can be measured or proven. With my work and its’ basis in observation there is an attempt to faithfully observe what I see in front of me, but I find if I get too caught up in measuring and trying to be accurate, things get worse, and look wrong, not right. And of course there is the Picasso quote about a painting being a lie that tells the truth, which I think is great, but truth is different than accuracy or being right. I don’t know exactly what you mean by authority in painting. For some reason Velasquez and Damien Hirst pop into my head. Velasquez because he paints the most amazingly real and convincing representation of the physical world without seeming to hesitate or even so much as blink. I had the strange and very real experience at the Met in New York of standing in front of a Velasquez portrait and feeling this overwhelming sense of a change in the air around me, as if I had suddenly been transported to another space, or as if someone had thrown the door open; a physical, almost chilling wave came over me and the air even seemed to smell musty, as air from 1650 might smell. I literally flinched and turned around to see what had happened. It was as if Velasquez had captured a moment of time in a bottle, sealed it up, and then, just as I was standing there, the lid came off and that very real moment popped out into the room and I was a part of it. But it was just really great painting, done with authority. It is a big jump and somehow a bit blasphemous to talk about Damien Hirst in the very next sentence. But most of his art seems to exist only as authority. If you took away his persona and his bluster and the entire hype/marketing/promotional/media juggernaut that surrounds him and his art, if you took away the aura of authority, there wouldn’t be much there, it is all just him. And I think one must admit that this is an art form in its’ own right. I can’t help but feel like there is a new vocabulary of art ideas that I haven’t crossed paths with yet; so I will interpret ‘authenticity’ as best as I can. It’s not something I consciously worry about at this point, at least in terms of my own work. I know when I was a student as I was drifting from studying architecture to being a painter, I had a brief stay in the illustration department. I chose it because there was an emphasis on drawing, painting, and color. As soon as I hit an actual illustration class, where you got stories or articles to produce an illustration for, I did really well, but felt completely disconnected from what I was creating. It felt false, like I was pretending. At the risk of sounding ridiculously romantic, I have to say that for me, painting, and making art, is to a large extent about finding something real, uncovering or excavating some sort of truth, something you know is true when you see it; something authentic. And I when I experience other art, other art forms, I think on some level I am always tuned into this; I am wanting to experience something that seems real, or true, or authentic, not something that feels false or hollow or like it’s pretending. It’s very much an intuitive sense, not something that can be measured, or quantified or analyzed. What is the hard part of making art, for you? I am a bit obsessive/compulsive and when I am really into a painting it is hard not to be working on it all the time. Dealing with the rest of life, which I love and enjoy, somehow still feels like an interruption. And being away from painting feels a bit like having an itch that I can’t scratch. Although making art is in most ways separate from the business side of being an artist they can’t help but affect one another, so it is at some point something that has to be faced. For long stretches it was something that was easy for me to ignore, to my own detriment and peril. All that end of my artistic life still feels like some foreign land where I don’t know the customs and culture, or even the language, but I am striving to make it work more to my benefit. Sometimes when I first start a painting, with that blank white panel in front of me, mixing up those first colors, I feel like a little kid, and I have this overwhelming sense of just how fun painting really is. 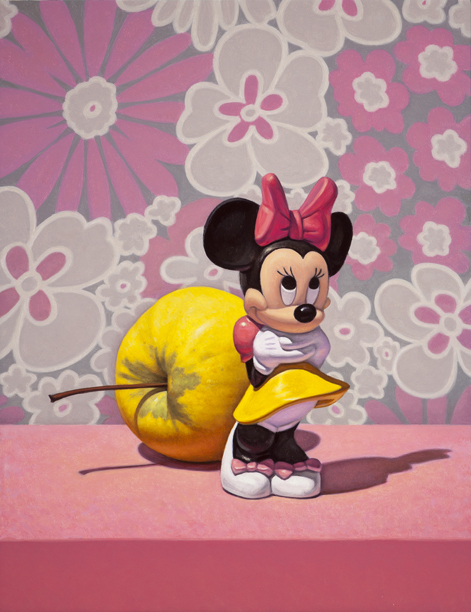 In your paintings objects are usually slightly larger than life-sized. Why is that? 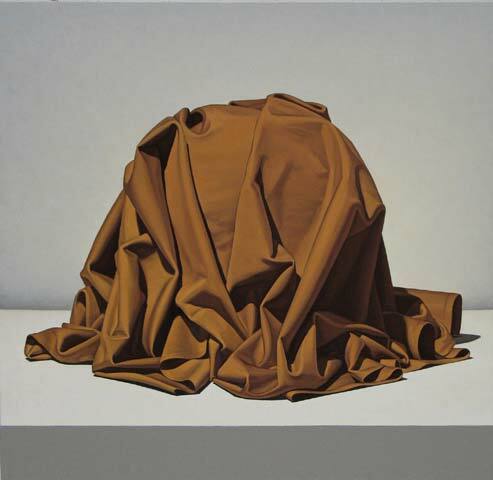 I think this issue, the life or presence of the painting as an actual object, is incredibly important to me, and relates to this scale question as well as to the attention I give to the surface qualities of my paintings. The size of the objects in my paintings seems to shift, usually for reasons that are more intuitive than conscious. They feel right at a certain size, which is usually linked to other factors in the paintings. The most aggressive subject matter I ever painted had the largest scaled objects whereas a quiet, somber set of paintings I did not long after that had almost normal scaled objects. At this point they are bigger than real life, but I don’t really experience them that way, they just seem right at that scale. There is no doubt it gives the paintings a definite and hopefully slightly disquieting presence as an object, and helps to separate it from merely being an image or a representation. It’s not possible to talk about these paintings without talking about color. Often the main inspiration for a painting comes out of an idea about color. Occasionally this means the color functions as symbolic, but most of the time it is fulfilling some formal idea or striking a chord anywhere from harmonious to disruptive. Since all the paintings are done from direct observation, I spend a good bit of time setting up the still life, even before starting on the drawing. I have lots of colored papers and fabrics and use these to create the color environment for the objects, which at this point is usually 3 parts; the wall plane, the tabletop, and then that strip of color that represents the table’s front edge. I fool with the lighting a bit too, so the set up is almost like a stage set. The painting process is an attempt to then get all these colors to feel as if they are in the same world, share the same light, make sense spatially, and find an active role in the whole structure. To put it in the most general sense it is a struggle to make the colors feel alive. Most of the decisions about color, particularly in the actual painting process, are intuitive, stuff just feels right or doesn’t, and there is a lot of pushing the colors around, trying to get them tuned in and making sense together. Color is almost a total mystery, at least to really pin down, and I think that is why it is so exciting for me. And, on that topic: a few years ago you painted a series of paintings dominated by grays and neutral tones. What made you want to make those paintings? I had been doing paintings that used really saturated colors throughout, especially in the environments I set up for the objects. I felt almost as if I had burnt out the color receptors in my eyes, that I had lost some ability to sensitively observe color. I became curious as to what would happen to the work if the color was primarily restricted to the objects themselves, and the “stage set “ was relegated to white and the differences white can take on, depending upon how light affects it. I worked almost exclusively this way for 3 years. It forced me to really hone in and observe subtleties in the colors of the light itself. It is something I’m sure I will return to, at least in part, and possibly soon. There was also the series of paintings that show single pieces of cloth wrapped around or draped over a form of some kind. What was the impetus for those? These paintings were called “knots” and “unknowns”. In the midst of the Iraq invasion/debacle there were a number of terrorist kidnappings that ended in beheadings. My work at the time had a political leaning to it (while George W. Bush was in office I spent a lot of time in disbelief, at best, and being outraged, at worst and it filtered into my studio). These wrapped forms were loosely meant to be stand-ins for the decapitated heads of the victims. The first 4 were all blood red with white, and were fabrics draped over a bowling ball, which is close to the size of a head. The series soon left this somewhat overt political reference, and they became more about a general sense of unknowing, maybe even mystery. They also took on, in my mind at least, a figurative reference involving gesture and a sense of movement, like a body or some sort of energy wrapped up and contained, but struggling to escape. Plus art history is filled with stunningly beautiful images and sculptures using drapery, and in many cases (Caravaggio in particular) beautiful paintings of drapery and beheadings, all in one. I ask about these because a lot of the paintings seem to function in this way. There’s some culturally resonant imagery and some of the meaning of that images is transferred to an object you put into an arrangement in your studio, to scrutinize and study as you make the painting. Would it be fair to say that the recent work is to some extent ‘totemic’? This seems like a really complicated question, and one without any simple or comprehensive answer. I think any object or representation is going to have very complex layers of meanings, both to the artist and the viewer. 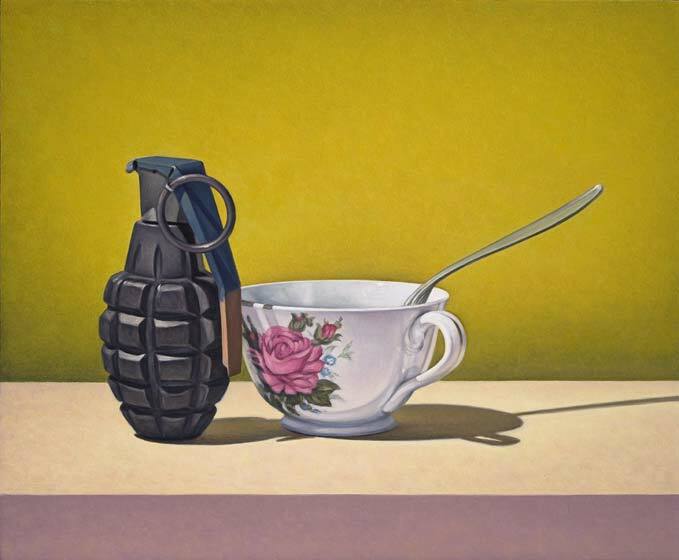 So there is no such thing as a completely neutral image; anything I paint has some degree of cultural resonance, whether it is a lemon or a grenade. 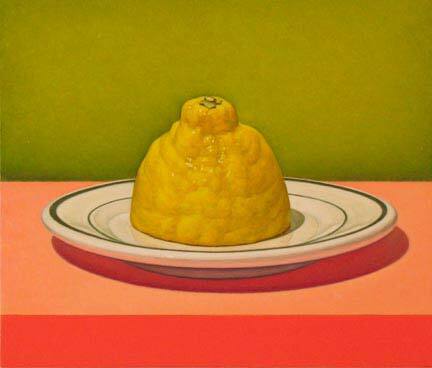 It all seems a bit like a big soup to me, and I like all the stuff I can pull out of it, from the expected and traditional cup or piece of fruit to the contemporary pop icon. In some cases my paintings do start with an idea about an object, an idea rooted in the power or resonance of the object itself. Guns, pills, grenades, the Minnie Mouse toy or even a slab of raw beef, these all originate with a desire to engage the larger cultural bell that is automatically rung by the object, all on its’ own. Part of the challenge with these loaded objects is to get past the quick, stock sort of reading of them to a more nuanced, aesthetic experience. This said, the process itself is extremely democratic; I struggle in the same way to get the gun or the apple to ‘work’ in the painting. As for the work being totemic, I do strive to give the paintings a very distinct clarity and distillation, as well as a sort of life and power of their own. But I can’t claim to have any control, or even understanding, of what it is they represent or mean in any specific sense, even to me, let alone anyone else. That makes perfect sense to me. Thanks, Tom! 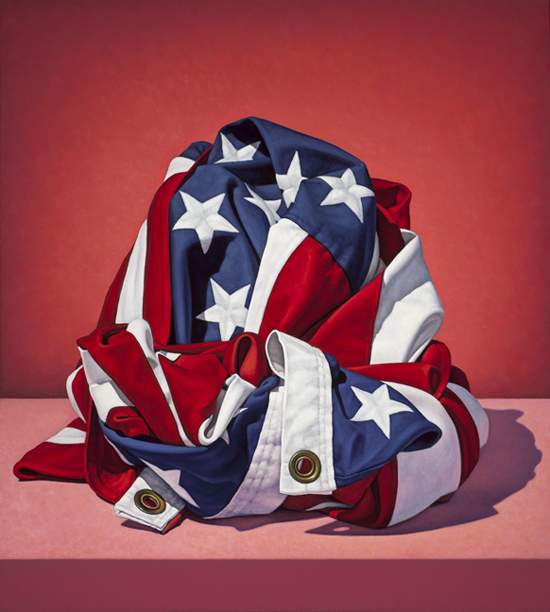 Tom Gregg’s work is at the George Billis Gallery in LA until March 24, 2012.